Will this beautiful wagon come to the US? Remember those rumors of a Buick Regal wagon? Well, they're still just rumors but man we hope they come true. Just as the recent reveal of the Opel Insignia sedan showed us what to expect of the 2018 Buick Regal, we now have a clear vision of what the Regal wagon could look like as Opel, GM's European division, has just unveiled its new Insignia Sports Tourer. This high-tech flagship model displays a ton of features that we would love to have in the US, it's just too bad American drivers hate wagons. Like the sedan, the Sports Tourer will come with an intelligent AWD system with two electronically controlled clutches. Opel says that the car will be fun to drive with a broad range of powertrains. The top engine will likely be the same 247-hp 2.0-litre turbo gasoline engine from the sedan with a new eight-speed automatic gearbox. The car will be loaded with technology such as LED matrix headlights, head-up display, 360 degree camera, adaptive cruise control, lane keep assist, and cross traffic alert. Where the Sports Tourer really stands out is in cargo volume. The Sports Tourer has around 58 cubic feet of cargo room, which is enough to fit a stand up bass according to Opel's press photos. The Sports Tourer is truly a flagship car for Opel, drawing inspiration from the stunning Monza Concept. It comes with optional premium ergonomic seats with heating, ventilation, and massage. The rear seats are also heated. The luxury continues with a panoramic sunroof and a tailgate which can be opened with the kick of the foot. Compared to the old Insignia, the new model has grown in proportions, but Opel says it now looks more athletic and agile. The car's wheelbase has grown 3.6-inches over the previous model, which should provide more passenger and cargo room. From behind the wheel, the new Insignia is very different from the previous model. The instruments and center console are all catered for the driver like a command center. A frameless touchscreen controls the IntelliLink system and the are also three rows of buttons. The top row is reserved for infotainment, while the middle and bottom rows operate HVAC controls and driver assistance systems. This system also has Apple Car Play and Android Auto compatibility which can be used without plugging the phone in with a cable. There is also a 4G LTE WiFi hotspot that allows passenger to connect to the internet on the go. 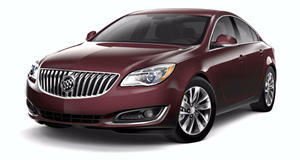 This amount of luxury would be perfect if GM decides to rebadge it as a Buick. There is still no word on the Buick versions of the sedan or Sports Tourer. This has been a pretty good year for wagon lovers with Mercedes and Volvo both rolling out stunning looking models. BMW also revealed a 5 Series Wagon that won't be coming to the US, but we would love to have a relatively affordable luxury wagon in the US.